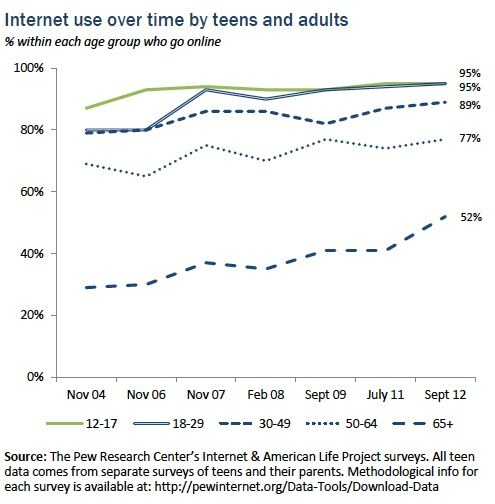 Fully 95% of teens are online, a percentage that has been consistent since 2006. Yet, the nature of teens’ internet use has transformed dramatically during that time — from stationary connections tied to desktops in the home to always-on connections that move with them throughout the day. In many ways, teens represent the leading edge of mobile connectivity, and the patterns of their technology use often signal future changes in the adult population. Teens are just as likely to have a cell phone as they are to have a desktop or laptop computer. And increasingly these phones are affording teens always-on, mobile access to the internet — in some cases, serving as their primary point of access. Smartphone ownership among teens has grown substantially since 2011; 37% of American youth ages 12-17 now have a smartphone, up from 23% in 2011. Tablets are also taking hold, as close to one in four teens say they have one of these devices. Taken together, teens have more ways than ever to stay connected throughout the day — and night. Three in four teens access the internet on cell phones, tablets, and other mobile devices. 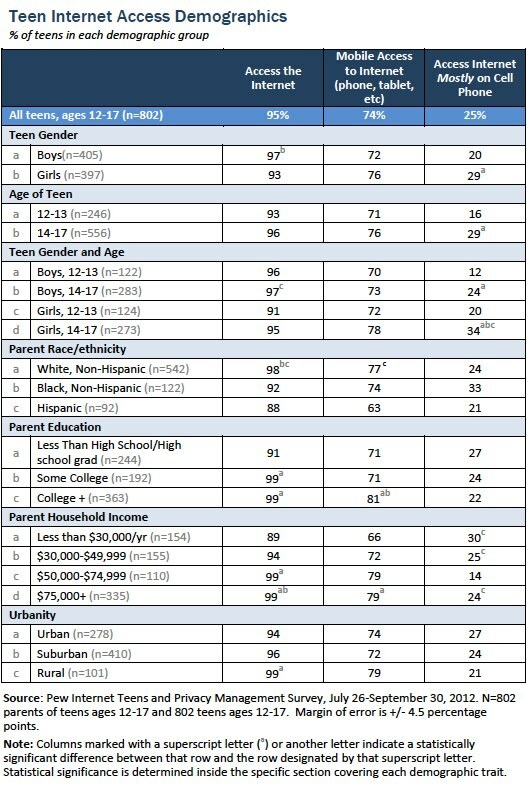 About three in four (74%) teens ages 12-17 are “mobile internet users” who say they access the internet on cell phones, tablets, and other mobile devices at least occasionally.1 By comparison, 55% of adults are mobile internet users.2 However, this gap is driven primarily by adults ages 65 and older, many of whom are not using the internet in any capacity, let alone on a mobile device. Adults under the age of 50, on the other hand, are just as likely as teens to be mobile internet users; 74% of adults ages 18-49 access the internet on a cell phone, tablet, or other mobile device. Eight out of ten teens have a desktop or laptop computer. Among the 20% of teens who do not have their own computer, two-thirds (67%) have access to one they can use at home. Taken together, this means that 93% of teens have a computer or access to one. White teens are more likely than black teens to have a desktop or laptop computer. Some 81% of white teens, compared with 64% of black teens, own a computer. Older teens ages 14-17 are more likely to have a computer than younger teens ages 12-13 (83% vs. 72%). Teens living in suburban areas are more likely to have a computer when compared with urban teens (84% vs. 75%). 71% of teen computer users say the computer they use most often is shared with family members. Few teens have exclusive access to the computer they use most often. Some 71% of teens who have a computer or access to one at home say that the computer they use most often is one they share with their parents, siblings, or other members of their family. The vast majority of younger teens share the computer they use most often; 81% of teen computer users ages 12-13 rely on shared computers compared with 66% of older teen computer users ages 14-17. By age 17, only half (51%) of teen computer users say the computer they use most often is one they share with family. Teen computer users living in rural areas are more likely than suburban teens to say the computer they use most often is a shared computer (80% vs. 67%). 23% of teens have a tablet computer. One in four teens (23%) say they have a tablet computer, a level comparable to the general adult population (25% of American adults have a tablet computer). Much like adults, family education and income levels are strong indicators of teen tablet ownership. Almost a third of teens whose parents have at least some college education or have household incomes over $75,000 a year own tablets. Older and younger teens are equally likely to have tablets. 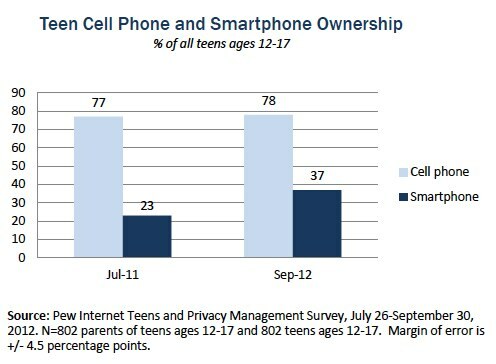 37% of all teens have smartphones, up from 23% in 2011. Teens with highly educated parents or with parents in the highest income bracket are also more likely to have cell phones. However, parent income levels do not map as neatly with smartphone ownership among teens. For instance, teens living in the lowest-earning households (under $30,000 per year) are just as likely as those living in the highest-earning households ($75,000 or more) to own smartphones (39% vs. 43%). Older teens are more likely than younger teens to have cell phones and those phones are more likely to be smartphones. Rural teens are significantly less likely to have a smartphone than urban or suburban teens. While many teens have a variety of internet-connected devices in their lives, the cell phone has become the primary means by which 25% of those ages 12-17 access the internet. Among teens who are mobile internet users, that number rises to one in three (33%). 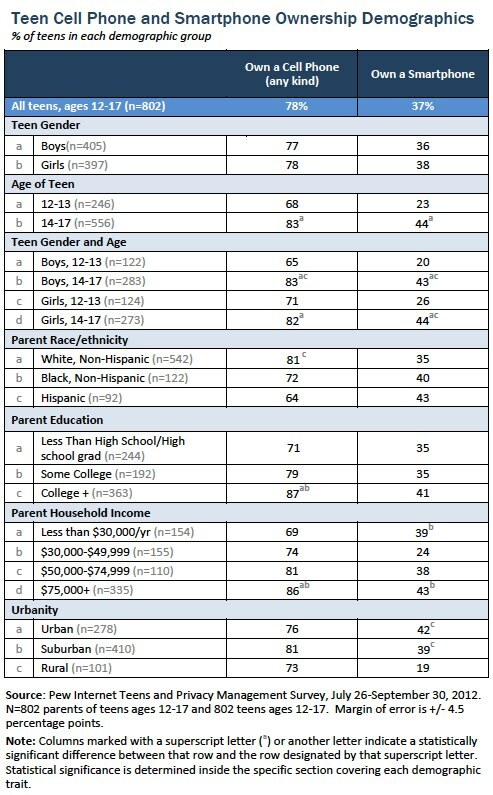 Among teen smartphone owners, 50% say they use the internet mostly via their cell phone. While cell-mostly internet use tracks with some of the same demographic trends as smartphone ownership (such as age), gender stands out as an especially important indicator. Although teen girls and boys are equally likely to have smartphones and are equally likely to use some kind of mobile access to the internet, girls are significantly more likely than boys to say they access the internet mostly using their cell phone (29% vs. 20%). Older teen girls represent the leading edge of cell-mostly internet use; 34% of them say that most of their internet use happens on their cell phone. 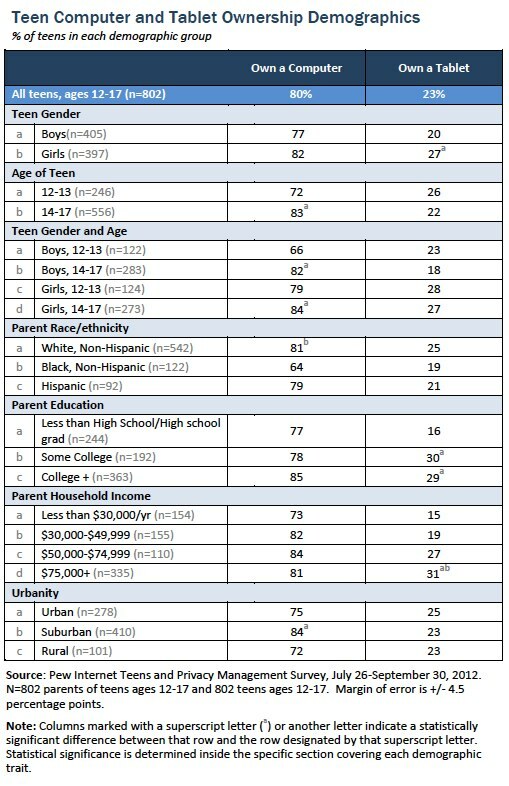 Among older teen girls who are smartphone owners, 55% say they use the internet mostly from their phone.